Chairman Kelvin Thomas has spoken of his disappointment and frustration at the Cobblers start to the Sky Bet League Two season, but is backing Dean Austin and the team to turn things round. Thomas admits he and the rest of the Town board were hoping for a better return from their decision over the summer to keep the squad together following the relegation from league one. There was interest in a clutch of players, but the club decided against another summer of upheaval on the player front as all those contracted, aside from goalkeeper Richard O’Donnell, stayed, and Austin was also allowed to add a sprinkling of new signings. 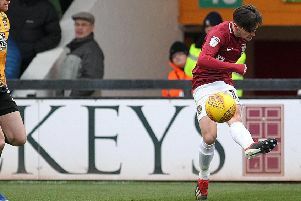 Despite optimism before the campaign kicked off, things haven’t gone to plan with the Cobblers 20th in league two with just one win from eight starts, and with no victories at home. They go into Saturday’s home date with rock-bottom Notts County on the back of two defeats and in desperate need of a win to keep breathing space between themselves and the bottom two of the Football League. Asked about the team’s lack of success to date, Thomas said: “Everybody is disappointed, everybody is frustrated and we feel that just as much as anybody else. “There is no hiding from the fact, and I don’t think Dean or the players are hiding from the fact, that results haven’t gone as well as we would have hoped. “I get a lot of messages, and I have seen the games, with people say the performances have been better, and I think they have been, particularly at the start of the season. “Possibly the past couple of games haven’t been up to the levels that Dean would have wanted, but I know he is looking to make a couple of changes and look at things a little bit differently. Referring to the decision to keep hold of the bulk of the squad in the close season, Thomas said: “We made some decisions over the summer from an ownership point of view in terms of players, and keeping players rather than selling them off and making massive changes to the squad. “We were hoping to get some return on that in terms of getting results, and it is frustrating, it is disappointing, and I think everybody in the club feels it.